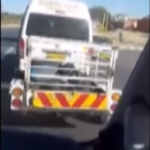 Video: The footage serves as an example of the unsafe behaviour of some long distance taxi drivers. Passengers should report such behaviour for their own safety. AS Namibians prepare to celebrate 29 years of Independence and schools closing for a short midterm break, traffic density on Namibian roads are expected to increase significantly as thousands of people will travel to different destinations for the long weekend. With regard to the horrific accident that claimed the lives of 13 people a few days ago near Otavi and several other fatal motor vehicle accidents that claimed the lives of six more people the Inspector General of the Namibian Police directed an appeal to the Namibian Nation to act responsibly, so as to be safe, particularly when on the roads. Lieutenant General Ndeitunga said motorists are reminded to practice the following three very important elements, namely: Concentration, patience and tolerance. In the same vein General Ndeitunga also reminded property owners to ensure safety and security of their belongings before travelling. In the same vein the Secretary General of the Namibia Bus and Taxi Association (Nabta), Pendapala Nakathingo stated that law enforcement and traffic rules can no longer remain the only regulators of reckless drivers. Nakathingo said that currently there are no tools or devices to ensure that road users adhere to traffic rules and that the organization in partnership with relevant road safety stakeholders is working on the establishment of a new system that makes it compulsory for long distance buses and minibus taxis to have speed limiting and other safety devices installed in their vehicles to reduce the risk mass casualty crashes. He further stated that these devices would limit a vehicle’s speed to just 100 kilometres per hour. “It is very tragic to have 13 people die just like that. Road accidents of this nature have become more and more. We have taken note of these long distances drivers’ attitudes and behaviour on the road which needs to be reassessed.” Nakathingo said.